Below is an essay on "Help For Writing Maunsrcipts" from Anti Essays, your source for research papers, essays, and term paper examples. 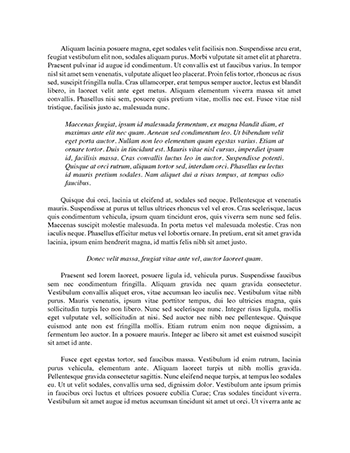 General: Manuscripts must be typewritten using Times New Roman using font size 12 with double-spacing throughout, i.e. including the abstract, footnotes and references. Pages should be numbered consecutively on the bottom right hand corner starting with the title page. In typing the manuscript, titles and subtitles should not be run within the text. They should be typed on a separate line, without indentation. Use lower-case letter type. The usage of italics should be, in the main, limited to microbiological terms. Use the computer automatic return at the end of lines; use double returns after the end of paragraphs only. • Abstract - each paper must contain an Abstract not exceeding 150 words, reporting concisely on the major components within the review - this section should be comprehensible in its own right. References should not be cited herein. Abbreviations should be avoided; if absolutely necessary they must be defined. • Introduction - briefly introduce the topic of the review and try to place it in context to the specific area of food science and health research. • Main body of review – divide into several sub-headings to delineate the different sections/topics addressed within the review. If necessary, each section may be divided into further subsections, but try not to use more than three levels for subtitles. • Discussion – may draw specific attention to developing trends, conflicts in the literature, the suitability of different research approaches, etc.